Apple’s commercials about the iPad have always included some mention of the use of the device in Education. We use ours a lot to read, research and with a few apps we have found have fit nicely into that ‘education’ group. In our line of business, it is important to give the right visual message to get a point across in as few words as possible. True, we get wordy here on our site, but we just have to much to say using plain text. When doing a layout of an ad, new user interface or product packaging, the fonts used for the lettering is key to it’s success. There are a few folks that know their list of fonts in their head and they just seem to pull the right one out of their hats which work. Other folks go through a long list using trial and error. An app we found, Typography Insight, is a very nice app to learn about the particulars around fonts that make each one unique. With a better understanding of the differences, it is becoming easier to know which font will work from the beginning. And most importantly, why that font is right. 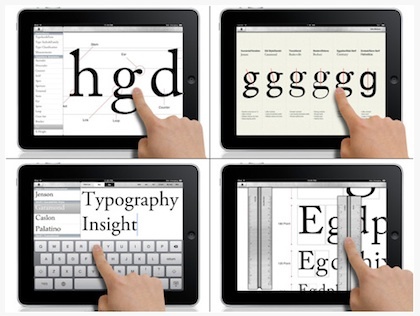 The iPad only app does more than just list out all the popular fonts. Typography Insight is about educating the users to help make better decisions. Choosing a couple fonts, it is possible to see each one side by side down to zooming into a particular area of a single letter. Even overlaying one on top of the other. Learning Basics: Terminology, Historical Typefaces, Measurements, and Typesetting. The Historical Typefaces area has a nice mix of showing the individual parts of the letters that have changed in the font over the years as well links out to important bits from Wikipedia. The Ascender / Descender lets you view just the upper or lower part of a font compared to other fonts. We have found this to be handy when we are working with a tight visual space or the opposite where we need letters to drop a bit to ‘fill’ an area. Does everyone ‘need’ Typography Insight? With so many folks using Word Processing tool or creating their own cards and handouts, yes. It’s a handy tool that will help make the right font choice without many hours of printing and adjusting.